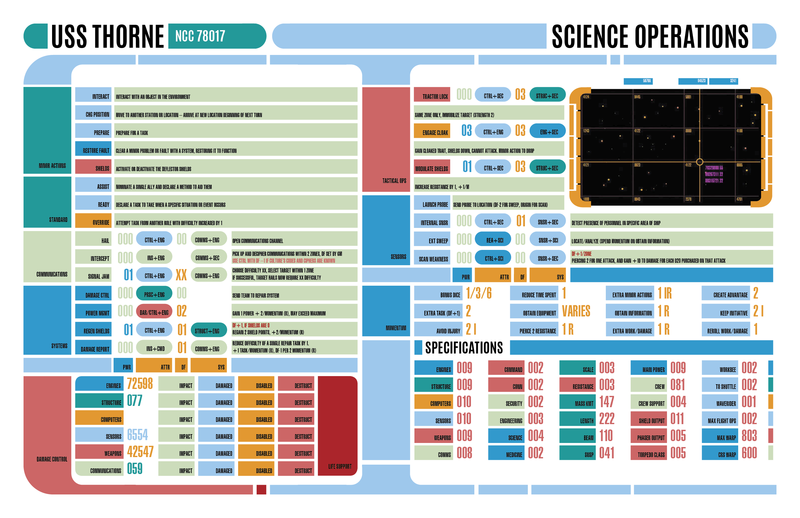 LCARS Reference Sheets – RPGs… in Space! Have a play-aid to reduce the need to lookup stuff in the book – as much as I love many things about the book, it is hard to bounce from page to page quickly. Incorporate the stats for the ship (Systems, Departments, etc.). Add some extra flavor stats. Split up the tracking so that multiple players are involved – so Tactical tracks shields, Engineering tracks power, and so on. This keeps interest and teamwork in-play. Add extended stats, i.e., for shuttlecraft. Pre-calculate where possible; i.e., for the ship’s talents, the -1 DF bonus while in Main Engineering, etc. Make it look “Star Trek”. My Okudagram skills are not spectacular and these don’t look exactly like LCARS, but they are good enough to accomplish the goals. They print onto 11×14 sheets, and I print them to a nice 60# paper for sturdiness. 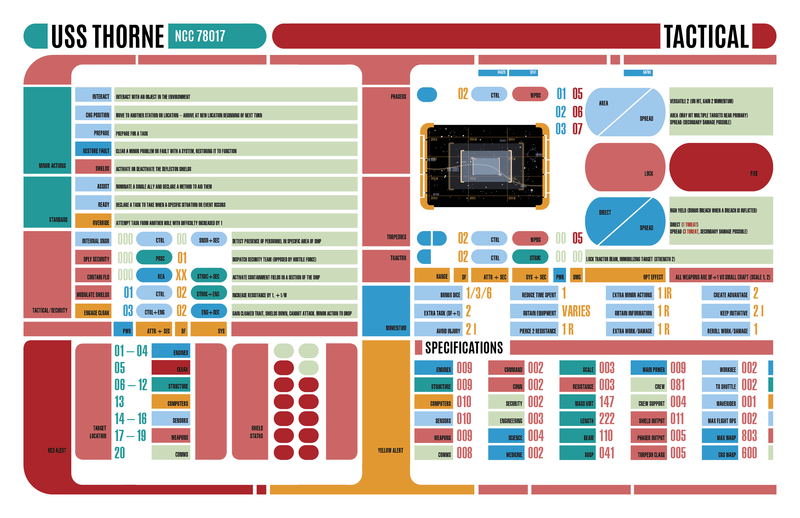 These LCARS sheets are for a specific Nova-class ship, the USS Thorne. Yes, it is also equipped with a Romulan Cloaking Device, because there is a Romulan exchange officer on board and we play in a post-Nemesis timeline. Since it is so specific to my own crew, I’ve packaged the lcars references so that they can be downloaded. These are InDesign files and therefore require Adobe InDesign to open/edit. You can get a 7-day free trial to InDesign at that link, but be aware that it is a lot different than using a word processor (like MS Word). Images are from various sources including online LCARS sites and I don’t make any claim to those; they are placeholders. LCARSC seems to be offline these days and LCARS47 hasn’t been updated since 2015, which is too bad because AWESOME. 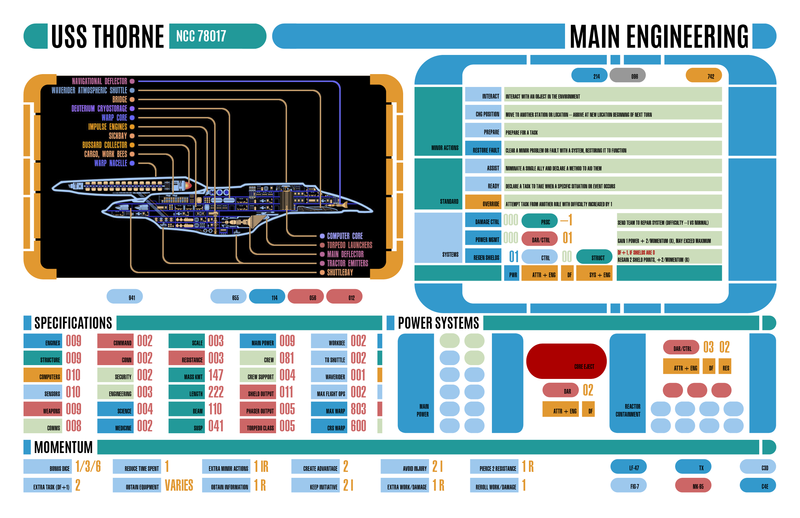 The LCARS font I used was obtained from the FXDiagram project on GitHub. 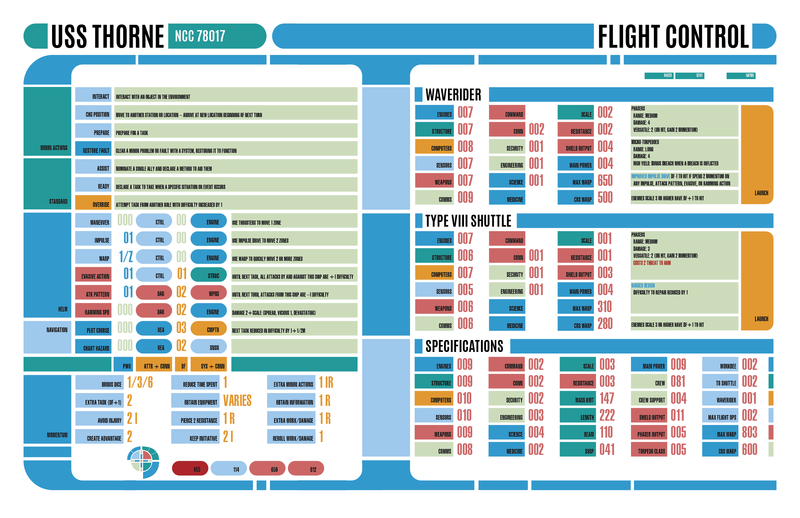 Update 5/27/18: I’ve posted a PDF of a generic 1-page shuttle sheet. Image below – it is also designed to be printed on 11″x17″ Tabloid.